Chris - Empress of France - 1956 - Check Mate! 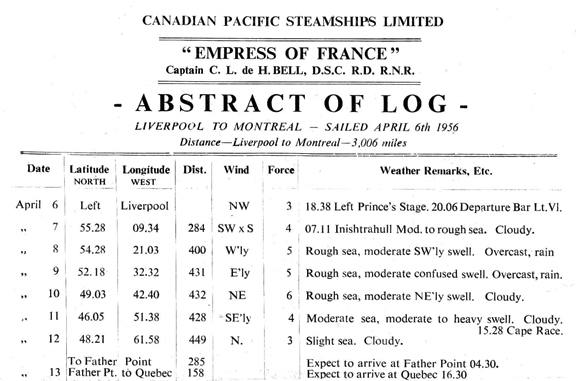 Our eight day passage from Liverpool to Montreal passed quickly. Not until we passed Cape Race, Nfld and later entered the Gulf of St. Lawrence did the sea conditions calm down. Prior to this the North Atlantic had been a mixture of rolling, choppy, or rough seas!! Once safely in the Gulf, and then all the way through to Montreal, it was smooth sailing. Having a starboard side Family Cabin with four-berths and three portholes was far more comfortable than the Strathnaver cabins. 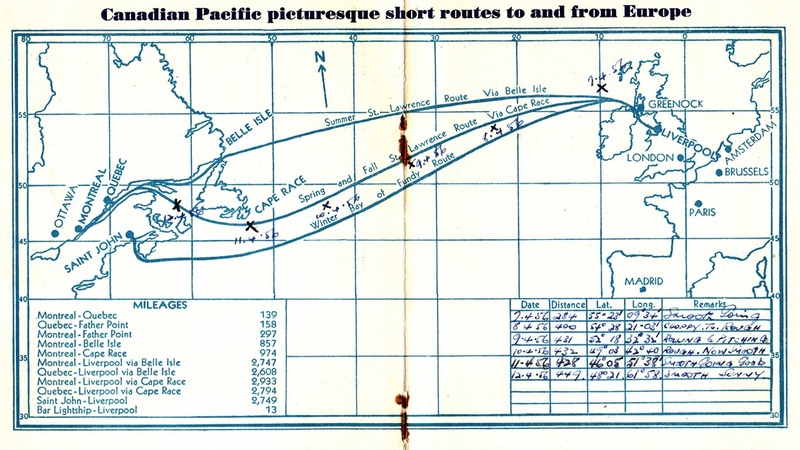 There was even a daily newspaper to read on this sea route. We were able to receive some relief to cover the travel expense to reach Canada. Much earlier on in the immigration process at Canada House, London we had applied for and were accepted to receive an Assisted Passage Loan from the Canadian Gouvernment. The loan helped cover the immediate cost of travelling to Canada. It had to be repaid in full within 12 months after landing in Montreal. When we departed Liverpool on 6 April 1956 I had fairly quickly acquainted myself with the ship. I also found that the CP Passenger List booklet was filled with interesting seagoing information that helped me understand what I had first become aware of onboard the Strathnaver two years earlier. It covered things from 'made bells' to decoding a CP Officers uniform from the clues located on the sleeves and lapels of his uniform. Click here to view some interesting and helpful excerpts from the booklet. We arrived in Montreal on a crisp, clear and sunny April 14th, 1956. For the first time in this crossing I saw small chunks of ice floating on the water near the dock. We disembarked as Canadian landed immigrants.